It is not the aim and is beyond the scope of this chapter to show and to discuss all issues concerning treating nephrourological disorders. In many aspects, we can refer to other chapters of this book. 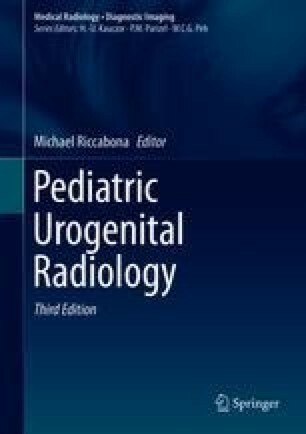 Basically, pediatric radiologists are responsible for imaging, clinicians (pediatric nephrologists, pediatric urologists, general pediatricians, etc.) for treatment. This strict separation is valid, but somewhat questionable for optimal diagnosis and treatment. The task of preserving renal parenchyma, to the best of our knowledge, can be achieved only by cooperation and an interdisciplinary approach in many situations. The partners need to know about each other’s thinking, intentions, and expectations. Interdisciplinary discussions with an exchange of knowledge are of value. This chapter is dedicated to discussing the cooperation between subspecialties and to showing aspects of the treatment of disorders. The discussion will include the dilemma of guidelines in general and in the daily routine of single centers. Disorders with minimal or no contribution of imaging to clinical decisions (e.g., dosage or duration of steroid treatment in glomerular disorders) are excluded. Quite a few aspects of this clinical management are shown in other respective chapters – the overlap with other parts of this book is desired as this chapter tries to provide a more clinically oriented practical approach.